TM Streamyx International Cap Relaxed? The capping will not be rollbacked or removed, only “relaxed”. They will continue to watch the performance of the network in the coming week and make further tweaks. Apparently, they tell me that got people who wrote to that address (impact@tm.com.my) to say that things are OK. They say that this proof that the service is better now. We will find a way out immediately, today we are looking at some parameters that will allow the equilibrium of usage. If it’s still a challenge in the next 1-2 days, I’m going to pull that out first and then we will relook, get feedback from our users and see how we can do this better. “IF it’s still a challenge…” being the key phrase. I am totally perplexed as to how can they have come to this conclusion which basically ruined all the goodwill generated from the previous announcement. People who know about the impact address are most likely people who are upset that they are capped, I can’t imagine a huge amount of people e-mailing them to tell them that their speeds are fantastic. I personally have NOT received a response from TM from impact and it seems TM shouldn’t even bother having a corporate communications department if this is the way they put out fires. penipu. Cakap nak perbaiki masalah tapi tak settle pun. Dibiarkan adalah……. lol, lesson 1, u can never trust/believe what tm dudes said!!! My line may be fine but it wasn’t me who reported that things were fine to impact. don’t ever believe any single word from this people and promises..curse this people.this is the last month i use screamyx and going to terminate it. we pay full but get half of the service…. the question is how many ‘people’ that email them and said everything is okay? or maybe percentage of email about OK vs NOT OK? can we really trust that ‘people’? what if that ‘people’ is TM insider that email them just to give some fake data? because i can’t believe it when there’s a customer that can said their broadband is OK… because with TM, broadband NEVER OK..
dah2..this month’s bill..dont pay ok…we boycott….together we win..together…they lost…huahuahuahua..
My ofis line 4mbit uncapped at about 8.30pm. P2p still caped without vpn. Looks like they invested into another traffic shaping devices. 3. dissatisfied with the outcome, i filed a complaint with SKMM (within 2 days, someone from SKMM called me to verify the complaint and said that they’ll forward my case to TM. At the same time, I received an automated email from SKMM regarding this. 4. The next day, a TM technician calls me up to say that they’ve fixed my problem and ask that I monitor the problem for any reoccurance. 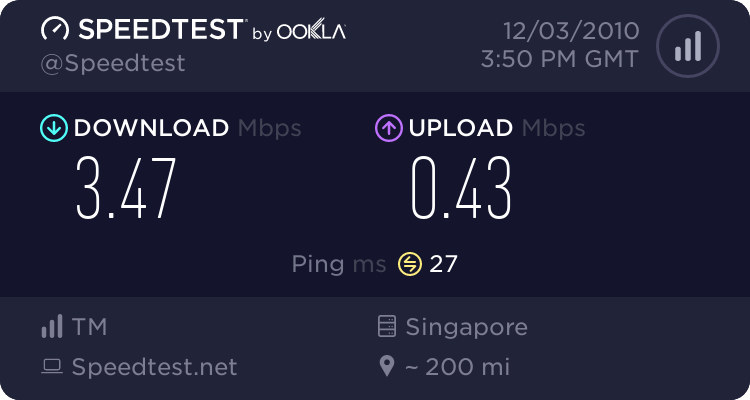 it has now been about half a day and i seem to have my proper speeds back. *phew* let’s hope this lasts. just upgraded to 4mpbs today, fxxxked getting capped for my torrents at 50kb max!! download 2 files, becomes 25kb! Everyone on 2mbit, DO NOT UPGRADE TO 4mbit. Those on 4Mbit, start writing to TM and said you want to downgrade cause you dont get what you paid for. from 160 kbps , then 3 weeks ago, capped to 90 kbps. and this week already 20 kbps. im using 1 MB line. why the hell they did all these and then ask us to pay.. i hate this monopolize thing!